– Auxiliary supply voltage: 220-240VAC standard; 24VAC, 110-127 or 380-415VAC type on request. – HIGH and LOW measurement storage. – 1 relay output with 1 changeover contact (SPDT) for DMK… R1 only. – Housing: flush mount 96x48mm / 3.8×1.9in. – IEC protection degree: IP54; IP 20 at terminals. 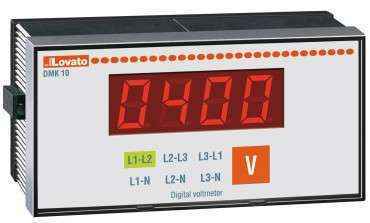 – Voltage measurement range: 15-660VAC. – Operating frequency range: 45-65Hz. – Programmable VT ratio: 1.00-500.00. – Accuracy: +/- 0.25% f.s. +/- 1 digit. – Current measurement range: 0.05-5.75A. – Operating frequency range: 45-66Hz. – Programmable CT ratio: 5-10,000. – Accuracy +/- 0.5% f.s. +/- 1 digit. – Programmable CT ratio: OFF/5-10,000. – Accuracy: Voltage +/- 0.25% f.s. +/- 1 digit, Current +/- 0.5% f.s. +/- 1 digit. – Frequency measurement range: 15-65Hz. – Accuracy +/- 1 digit. DMK 04 – DMK 04 R1. – Cosphi measurement error:+/1 0.5 degrees +/- 1 digit. – Cosphi measurement in 4 quadrants. – Accuracy: +/- 1 degree +/- 1 digit. DMK00 1 voltage value, 1 max voltage value, 1 min voltage value. DMK00R1 1 voltage value, 1 max voltage value, 1 min voltage value, relay output for control and protection functions. DMK01 1 current value, 1 max current value, 1 min current value. DMK01R1 1 current value, 1 max current value, 1 min current value, relay output for control and protection functions. 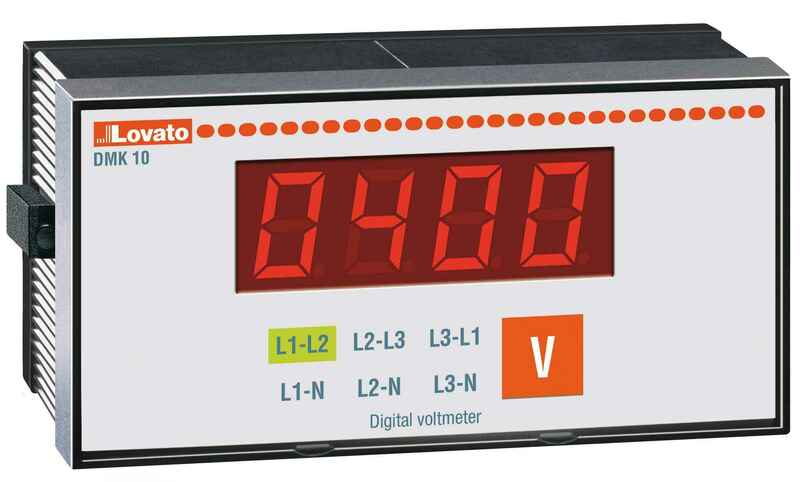 DMK02 1 voltage or current value, 1 maximum voltage or current value, 1 minimum voltage or current value, The DMK02 can operate as a voltmeter or ammeter. It is duly equipped with two front plates (V and A) which must be fitted by the user depending on which instrument is required and on the wiring scheme used. DMK03 1 frequency value, 1 max frequency value, 1 min frequency value. DMK03R1 1 frequency value, 1 max frequency value, 1 min frequency value, relay output for control and protection functions. DMK04 1 cosphi value, 1 power factor value. DMK04R1 1 cosphi value, 1 power factor value, relay output for control and protection functions.